Hey there! I’m Cristina and a late 20-something. This blog was to help me document my journey through weight loss, but it became about my health and my life, which includes my love of fitness, food and good drinks. I started tracking my weightloss at around 240ish and a size 24. I’ve competed as a bikini competitor in the NPC where I placed in the top 5 in my last season. I’m a lover of lifting and running, but my name has become more metaphorical and I’m ok with that. I left my career in higher education to go back to school for a degree in public health because I wanted to have a foundation of health sciences while I was becoming a health coach. I have obtained my health coaching certification through ACE. My story started in January 2012, but I hadn’t always been overweight. I had gained over 115 pounds in college between my sophomore and senior years. It’s hard to look back at photos from high school, and my start of college, and think about how I believed I was fat. I wasn’t fit by any means, but it wasn’t comparable to what being an obese person was like at all. So, I started where pretty much everyone starts – as a resolutioner. I had gone through some HUGE life changes in November and December 2011 and I needed something I could control. My physical health was what I became attached to so I could regain control of my life. I started with my nutrition, but only loosely. I counted calories because I knew I was consuming too many. However, my restriction started around 2,000 because I knew I was easily consuming twice that many regularly. At this point, I had eliminated coffee because I didn’t know what a good cup should taste like and I loaded it with cream and sugar – so better to just not have it at all. I eliminated soda, even diet soda. I cut out foods that I knew weren’t good for me like chips, pasta and candy. This not only helped me establish a better eating plan, but saved my wallet too. I immediately started seeing a change because this was a big change for me. It took about a month for me to add in activity. I did Zumba because it sounded like a fun way to move around and I had grown up dancing. Zumba reminded me of that. It wasn’t easy and I’m sure I looked crazy doing it, but it got easier. Every now and then I would venture towards the dumb bells, but at this point I didn’t know what I was doing and just focused on eating better and moving around. In March 2012, I packed up and moved Massachusetts for a job in my field. There’s stress with moving and starting new job, but I didn’t know anyone so working out was easy because it gave me something to do with my time. While I had been looking for jobs in my industry, I had also applied to an accelerated graduate program at Northeastern University. I happened to be accepted into the program around the time I accepted my job offer. It wasn’t intentional, I thought something good would have to happen – they just happened at the same time. I found Zumba at my new gym and a co-worker who didn’t mind going. We also found Pilates together, which made me feel embarrassed and honestly, I didn’t enjoy it. I like challenges, but I couldn’t figure out why anyone would do this for fun. By the fall, I was working full-time hours and I was taking classes full-time through Northeastern’s College of Professional Studies. I could get my degree online and work without being concerned I would have to leave work early or find a way to fit it in. However, with some of the craziness that is graduate school, I put my weightloss on a slight hold. I didn’t gain, but I didn’t really lose. I was still mindful of my eating, but I had decreased my activity levels significantly. Honestly, this was still progress. The biggest changes happened when I graduated the following fall. In 2013, I was also diagnosed with PTSD. It was and wasn’t shocking. I grew up in a physically and mentally abusive household, but no therapist I had ever seen had considered that a possibility. We had been putting bandaids on problems for years, but not always getting to the root. This was the first time we looked at cause and effect and built solutions. I ate Paleo for almost two months and I did lose, but it wasn’t because I ate Paleo, it was because I was in a caloric deficit and that’s how you lose fat. I learned you can have bacon and eat it to, but there wasn’t really a structure to moderate foods like these, so I still didn’t have balance. I spent the spring continuing to make a few Paleo recipes, but going back to what I knew, calories and moderating my foods. I went back for another attempt with yoga. I tried Bikram – you know, really hot yoga. I went consistently because this time around I enjoyed it – it was something about the heat. When the weather got nicer, I added some hiking in here and there because it’s New England and do you even live here if you don’t do that? In June 2014, I decided I needed something to push me. Something that would make me work out of my comfort zone and help me obtain more progress in my weightloss journey. Weight lifting did just that. Competing in a bikini competition did just that. I changed my eating to six times a day to make sure I was getting meals spread throughout. I started working out six days a week. I threw myself into lifting and learned everything I could. My initial macros were hilarious and way off. That’s when I found an online calculator, which helped me trash the initial macro calculations and reconfigure them appropriately. In the first month of tracking my macros and weightlifting I had lost 12.5 pounds. This was huge for me because it was breaking the misconceptions I had about women and weightlifting, as well as food. In 10 weeks, I was down 17.5 pounds and it was mostly from my middle. I was no longer a size 10, I was a size 6. My running was improving and things felt better in and out of the gym. I was gaining confidence in the gym. I had forced myself to be ok with just walking in and picking up the barbells, but now I wasn’t forcing myself. I met my boyfriend during this time and I honestly believe that things happen when you least expect them to. On the day of my show I was 150 pounds. I had lost 24 pounds in the course of 21 weeks. My first show was November 2014, and after I continued tracking my food, but not as strictly. I did gain some weight back, I was high 150s, but not quite 160. After the holiday, I wanted to try to compete again, I started prepping after Christmas and like all things – timing is everything and it just wasn’t my time. Throughout 2015 I dabbled with different exercise styles like plyometrics along with weight lifting. I also got a new job, which meant a change in my focus – I wasn’t interested at the time to do my own programming, so I did what many people do, I hired a coach. I was skeptical of trusting someone else, but felt it was necessary. I worked with my coach through a second bikini season in early 2016. During that second season, I had my body fat tested and learned that I was much leaner than I and my coach had thought. So a month before my show I decided to set up a consultation for skin removal. That had never been a part of the plan before, but maybe it would be now. A few weeks before my show, I had my consult and we picked a date for surgery. I had surgery a month post-show. After season, after recovery, I started working out on my own terms again. I was doing it because I enjoy it. I was competing for sport. I was losing for sport. I attempted another prep in the Fall of 2016, but mentally I wasn’t having it. There were a lot of things going on and I took medical leave from work. I’ve had a lot of praise for taking leave and putting my mental health first, I’ve also gotten a lot of crap for it because many don’t see mental health as a reason to take a break from work, but it is and our mental health impacts our physical health. This is one more thing that lead me to leave my full-time job and coach my own clients. In January 2017 I felt capable of competing again and I prepped myself for the stage a third, forth and fifth time. I placed 4th in both classes at my first show that season and I struggled to enjoy it. Looking back it’s a great accomplishment and while the season wasn’t perfect, it opened my eyes. I had some of my heaviest lifts during that season. I challenged my heart and my head. 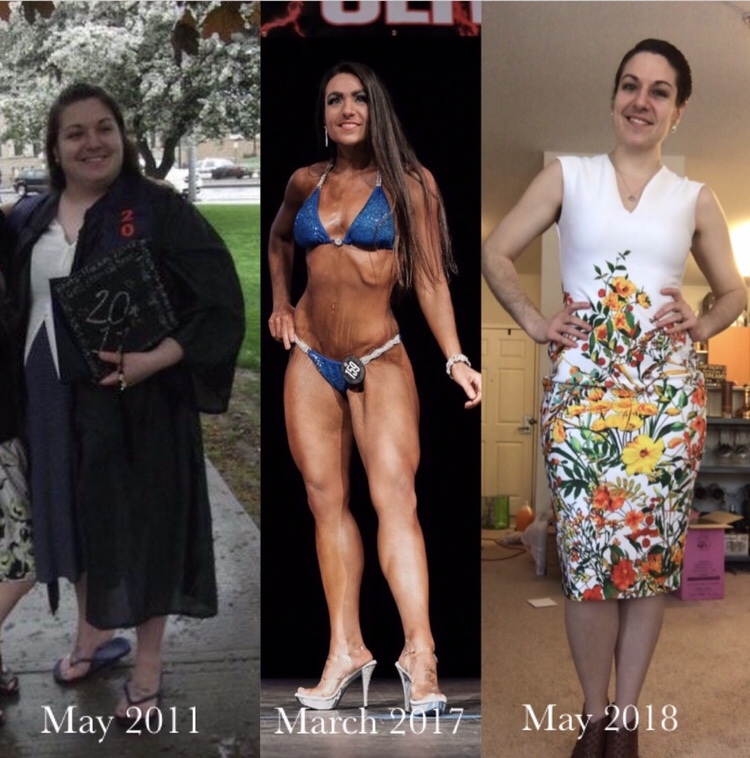 I started this journey to become a healthier size, and along the way I tried different things and fell in love with different aspects of health. I wholeheartedly believe working out and eating well are important actions in a healthy lifestyle. I also believe we need to understand our emotional brain in relation to our behavior. It’s not a punishment to choose healthier options. I also think that if you feel guilt when having a treat, you need to step back and think about why. Working out isn’t a punishment either and if you feel that you’re dragging yourself to the gym or for a run, you should re-evaluate your goals and think about what is the priority in that moment. This journey was about how much space I was taking up, then it was about challenging myself, then it was about my brain – and sometimes it’s about it all. But mostly, it’s about finding a good place in this world so I can help others feel capable and accomplish their goals too. OMG this is awesome! I love your blog already! I have followed your journey for quite some time now. And have seen you grow and learn and mature into a very special person, and as someone who can always see the better part of life even when at times it seems against you. I am so proud of you and how hard you have worked to accomplish and continue to control your life in so many great ways.